On Thursday November 20th, The Manifesto presented it’s eponymous second print issue to the New York music industry community. 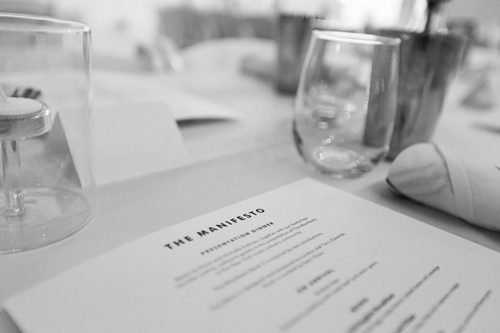 Book Two is inspired by new introductions, and the dinner event marked the official debut of The Manifesto to New York. It seemed fitting that the presentation of this book and its stories were held at 168 Bowery, situated in the downtown Nolita area. The location was once a subway station in the 1960s, and today is a large raw space, featuring an open plan kitchen, and is managed by the a new friend to The Manifesto - Joe LaPadula at Openhouse. 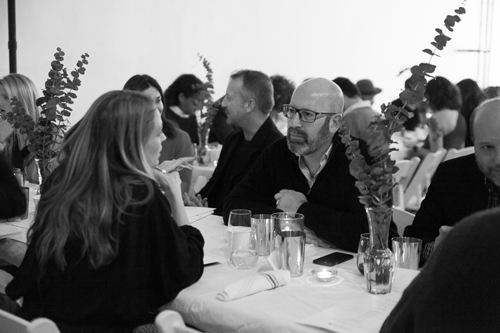 An intimate gathering of 60 music industry and creatives were hosted by Jennifer Justice, the inspirational woman who features in Book Two and also happens to be the SVP of Strategic Marketing and Business Development at Roc Nation. 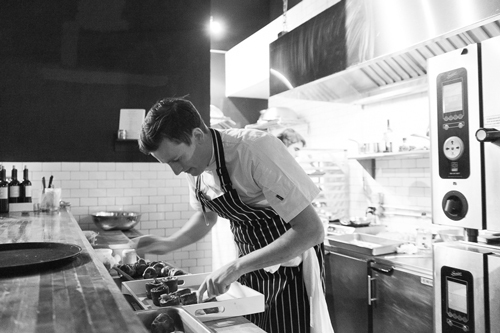 Guests were treated to a 4 course menu designed and prepared by London chef Terry Edwards. The British inspired, locally sourced selection were complemented by wine from Scribe Winery in Sonoma California, namely the 2012 Estate Chardonnay, 2013 Carneros Pinot Noir and 2014 Nouveau. A special thank you to Peter Eastlake for introducing The Manifesto to Scribe Winery! Guests included those who are special to The Manifesto, they included Sterling Sound’s Greg Calbi, Imagem’s Jason Jordan, Atlantic Record’s Camille Hackney, FADER Label’s Tacie van Lieu, Squarespace’s Ryan Stansky and Jessica Kausen, Chris Sampson from Superfly, and New York music attorney Craig Averill. The evening was peppered with speeches made by Jennifer Justice and The Manifesto’s co-founders Michelle Sullivan and Beatrice Hurst. Special mention was given to three individuals who have played a role in supporting the development of The Manifesto - SynchTank’s Joel T Jordan, Squarespace’s Ryan Stansky and Win Music’s Sean Glass, who also curated the music for the evening.